Taken with Olympus E500 digital camera March 3rd 2007. Click image for larger view. I like the way I was able to capture the falling snow in this picture. 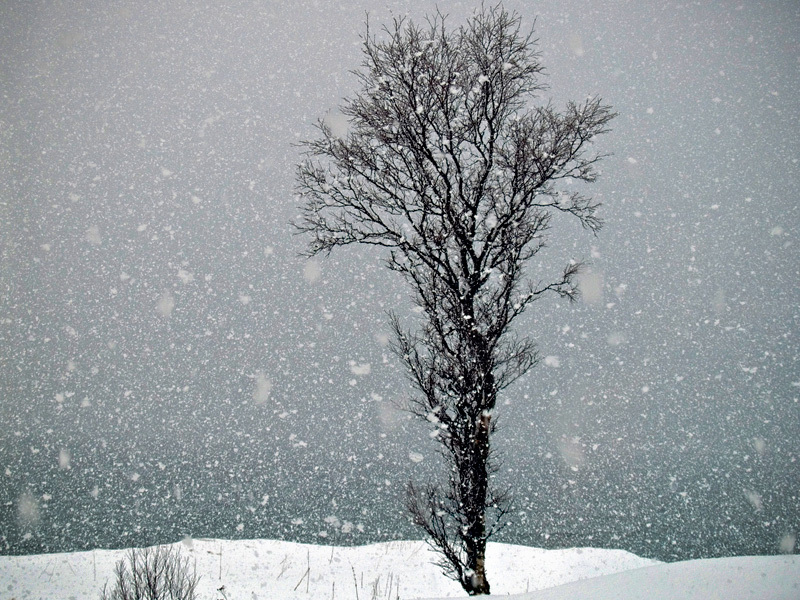 The lonely tree and the greenish ocean in the background make the scenery look very desolate and cold. Also check out this picture of my private Narnia forest and my 2009 Norway photo calendar 🙂 Also follow Photos from Northern Norway on Facebook. Wow…this is a stunning shot! I love it! Very nice. I imagine that it would make a perfect cover for a best selling book. Hi Thomas and Happy New Year to you! Wonderful picture of massive snow fall. I’m not sure if it looks cold, more like fresh, crispy to me – but then again I’m a Norwegian. My last post was about snow fall in Oslo. Please visit and comment if you like to be listed on my ‘Snow report around the world’! What a snowy picture. I’m especially impressed that you took your camera outside in the snow. All that snow means a ton of water that can get inside the camera. Excellent capture. This is beautiful! I grew up in Wisconsin, where it would start snowing in October and stay white until spring. I miss having snow all winter. Now we have muddy grass. Yuck. Also, I can’t get lefse at the store here. Thanks for sharing your photos! Hi~! Can I add your blog in my blog link? You don’t have to link me back if you don’t want to. Thanks! My gosh!! That is one of the most amazing shots of seen in a long time. I’ve had a hard time catching the snow just right without having to work the levels around in photoshop a bit. Great photo, it does look awful cold, you ought to get that tree a scarf now! And Narnia is perfect :D! Wow, that’s really beautiful! Great capture. I’ve been staring at this picture for a good 5 minutes and thought to leave a comment finally. The image nearly mystical so much that if you stare long enough you think the snow it actually falling in a still image. I need to get back to work before people start worrying about me staring at my screen … great photography overall on your site. Thanks for sharing.